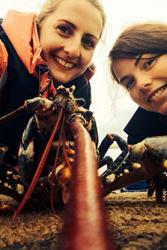 Hannah Finch-Saunders and Robyn Cloake (research assistants) with a lobster (Homarus gammarus) during the research project.A three year data gathering project to help Welsh fishers work sustainably culminated with a presentation at Bangor University recently. The £2M Sustainable Use of Fisheries Resources in Welsh Waters Project was funded by the European Fisheries Fund and the Welsh Government. Academics from the University’s School of Ocean Sciences worked closely with the Welsh Fishermen’s Association who welcomed the study which will help future proof the fishing industry. Jim Evans, Chairman of the Welsh Fishermen’s Association, said: "Fundamentally, the collaboration between fishermen and scientists in Wales that has developed through the term of this project, has not only produced invaluable scientific evidence on a variety of species of importance to Welsh fishermen, it will also leave a legacy that will enable fishermen and fisheries managers to maintain the evidence base providing a strong regional dimension to inform future decision making at a Welsh and EU level. I would like to extend my thanks to all the fishermen and their Fishermen's Associations for the vital contribution they have made to this project and of course a big thank you to the Fisheries & Science Conservation Team at Bangor University." Through a programme of scientific evidence gathering through collaboration between academics, industry and government funded bodies, policy makers and managers, the data gathered will inform management decisions to work towards a truly sustainable future for Welsh fisheries. The project ends at a time when the Welsh Government has had to consult with the European Commission about the Commission’s proposals to raise the minimum landing size for bass to 42 cm long. The project has improved greatly the understanding of whelk, lobster, crab, prawn and scallop fisheries. In particular it appears that the scallop population in Cardigan Bay is largely self-sustaining and may require more focused local management. As well as working in close connection to the fishing industry this project collaborated with the Welsh Government, Natural Resources Wales (NRW), CEFAS and scientists at Aberystwyth University.